Today it’s exactly once year since I’ve made my first post here. One whole year has passed on this project and it’s time again to look back. If EERIE was a human child, it’d still be wearing diapers but would also have grown quite a bit and learned enough to make the parents proud! On a personal level I was an ordinary Linux user who wanted to get to know his operating better. Distro hopping was fun (and informative) for some time but I wanted to get into it a fair bit deeper. While this of course involves a lot of reading, it’s always best to just try out things yourself. Thanks to virtual machines (which are clonable without much hassle) you can just do your experiments without fear of breaking anything critical. I did just that pretty often (things like uninstalling glibc is obviously not a smart thing to do – but there are moments you just want to know what exactly will happen if you do it anyway!). I’ve been breaking things out of curiosity sometimes (and aware of what I was about to do) but most of the time by accident or ignorance. I had already been interested in how programs are being packaged and how the various distributions were made. Soon the question arose: “How do you actually start a distribution?” I read what I could find on that topic and went back as far as possible to the beginning of some of the big distros. Then I tried to imagine how things really started and begun to grow. I finally got hooked by the idea to try this out for myself. It wouldn’t need to be something special – maybe not even something useful in the narrow sense of it. Just the result of a little playing around and a personal project for the sake of learning how you do it. Linux From Scratch (LFS) would be an excellent thing to begin with, I thought. And since I had been reading a lot on the net I figured that I might as well share my experience with the project. The worst thing that could happen would be that nobody cared for it but probably a few people might find it informative. I decided that it wouldn’t hurt to just give it a try as well. However I never completed LFS since I soon became distracted by plenty of other things! During my preparations (I was just reading the Filesystem Hierarchy Standard (FHS) since I had always found the filesystem organization a bit confusing) I begun to wonder if I really should just build a distro “by the book” (which LFS is literally all about) or if that wouldn’t mean a missed chance to do something else at the same time. There were a few things with every distro that I wasn’t happy with. Wouldn’t it be a good idea then to build an experimental distro which tried to do things differently in those cases? I decided to create a free blog and just start with it (and see if I have the discipline to stick with it). When I talked to Pheak about my ideas he liked them and joined the project. So far we’ve worked on it independently and he remained more or less in the background, helping me out when I ran into problems and giving suggestions. Pheak and I decided that the goal for project EERIE (short for “Elementary energy-efficient resource-saving internet experiment” ;)) would be to come up with the base for an experimental desktop distro. So its primary task was and is conducting a series of tests to find a base suitable for it. Also a subproject emerged from the desktop environment tests: The DDD (Desktop Demo DVD). It’s all about bringing as many DEs as possible together on one live medium so that anybody interested in it can easily try them out and compare them to each other. What has been accomplished so far? A lot actually. and by offering a few thoughts on Linux for desktop use. First I tried to do my tests with Gentoo but eventually changed to Arch (which Pheak admittedly proposed right from the start). The desktop tests were published in a series of 5 posts (dealing with 3 – 5 DEs each!). Then the various toolkits were discussed and compared briefly. After that I wrote about live cd creation on Arch and released the first alpha version of the “DDD”. 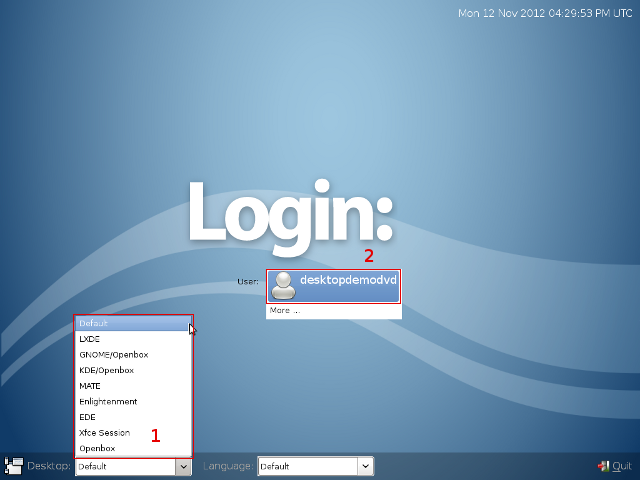 The next posts contained thoughts about which applications are crucial for a desktop distribution. Following this I posted comparisons of Qt-based programs to find out which were the most light-weight ones. While I intended to release a new version of the “DDD” and then go on with the GTK applications I postponed these topics and wrote about something I was just messing with at that time: Other Unix-like systems and their Arch variants. And last but not least I managed to get an interview with the EDE (a FLTK-based light-weight DE) developer! I’ve already taken a look back after 3 month and after 6 month. I’m quite happy that the trend of more and more visitors coming here has continued. There are days with more and days with fewer hits but there has not been a single day this year without any visitors. 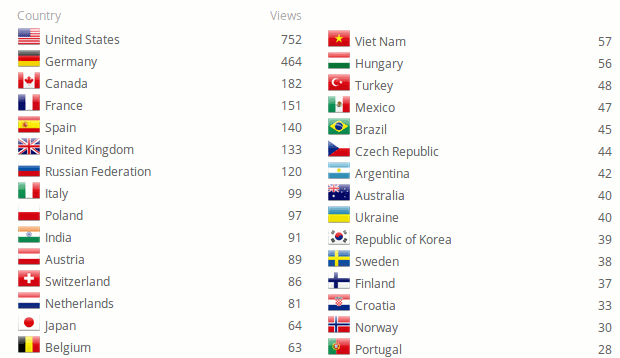 In the 12 month it has existed so far, the blog already scored well over 3,600 hits (exactly 3,625 as I’m writing this)! Number of daily visitors, etc. While the weekly hits are of course also fluctuating a bit, they cover a much longer period of time and thus show pretty well that overall the number of hits is increasing. As if it were called for this week is an exceptionally good one. While last year saw November scratching at the 300 hits per month mark, January and February have crossed it. March then stormed forward, skipping 400 hits and coming close to 500! And since June is not over yet – maybe it’ll be the first month to exceed 500? Also the average hits have increased steadily. The best month last year was November with 10 average hits per day; currently it looks like June has doubled this with 20 hits per day on average! The number of total hits has even more than doubled when we compare the six month of last year and of this year. 2,600 hits alone in the first half-year of 2013 – and counting! I can only say that I’m very impressed by these values. Of course I had hoped that some people cared for what I post here (especially since I’ve put quite a few hours of work into it). But even in my wildest dreams I would not have hoped for well over 3,500 visitors in the first year! I also didn’t dare to think I would be able to write 3 posts every month (on average). 36 posts so far – I think that’s a nice achievement. But none of all that is what actually makes me happy the most. While hits were also increasing before, I was really missing feedback. Now I’ve finally got my first comments and thanks to that got in touch with another light-weight FOSS enthusiast (and we’re discussing the details of something I’m looking forward to reveal to you later this year)! So what can you expect from EERIE in the future? Of course official announcements of what I made hints of above. Other than that I want to resume work on the “DDD” and get the tests with the GTK+ applications done. Not sure in which order. And then there’s of course a lot of other things to investigate when planing a new distro. Which standard C library to use? Which compiler to build with? Which package management system to choose? There’s enough to do so we won’t get bored! In post 19 (Creating an Arch Live-CD) I blogged about building a simple Live-CD on Arch Linux. It was the summary of my first attempts relating to that topic. In the meantime I created another ISO and published it as a first preview of my “Desktop Demo DVD” project in post 21 (The Desktop Demo DVD). This new entry will describe how my “DDD” was built (and thus how you add things like a graphical login manager and add users to a live medium). First I create a new virtual machine to keep things clean and tidy and then build and install the archiso tool. Next is building AUR packages edelib and ede as well as creating a custom repo for them. (I won’t repeat it in detail here. You can look up both things in post #19 if you wish). Just like in my previous building attempt, it’s necessary to create a new directory and copy over the “releng” dir from archiso. After that the various steps at configuring the iso can be taken. The first thing to do is adding the right packages to the file packages.i686. Since we want a graphical environment, it’s a good idea to have xorg-server installed (we’re going to use a graphical login manager this time, so we can do without xorg-xinit). Since the system is meant to run on about every hardware, X11 needs the proper graphic drivers. You may want to look for all xf86-video-* packages and add them. The only issue with that was that the openchrome and unichrome drivers were conflicting, but later (and older) one has been removed from the “extra” repository recently. Whatever you do, be sure to leave xf86-video-vesa in there – that’s the fallback driver that will work on most machines even if none of the others does (which is pretty rare however). Also it might be a good idea to add xf86-input-evdev just to make sure, you can use e.g. your keyboard in X. Adding virtualbox-guest-modules, too, will let X.org use the appropriate driver if running inside a VirtualBox VM. Next I added the desktop environments that I wanted to be available. I chose mate (remember to add the additional repos for it and ede! ), xfce4, lxde and e-svn as well as libxpm (needed by ede) and the packages edelib and ede. Finally the display manager lxdm is added as well. Thanks to systemd, much of the wiki page about archiso is outdated and no longer of any use. This is the case e.g. when it comes to starting the display manager automatically after booting. It suggests using an inittab and we could actually do so and use a sysVinit compatibility package as well. However it was already announced that this would be dropped in the forseeable future so it’s best to do things the proper way right from the beginning. LXDM comes with its own service file for usage with systemd. So the default command to configure the system for starting it after booting is systemctl enable lxdm.service. However this will of course not work in our case: First we don’t even have LXDM installed on building system and second – even if we had – enabling it there would not affect the live system. However for that reason there’s a folder called root image where we can make changes that will affect it! So what does the above command really do? No more actually than creating a softlink! Of course we can do that by hand, too. Let’s change our PWD (present working directory) to /root/archlive/releng/root-image/etc/systemd/system. Now let’s create the proper link, shall we? The command for that is ln -s /usr/lib/systemd/system/lxdm.service display-manager.service. Next step is creating a new directory (that is normally created when LXDM is installed): mkdir ../../lxdm and then I change into that dir. Afterwards I install lxdm on my build system and copy its configuration file into the new dir: cp /etc/lxdm/lxdm.conf . (if you’ve got LXDM installed on any other system, you can of course also copy it from there). Now it’s time to edit lxdm.conf: I simply add user “arch” to the blacklist (right at the end of the default configuration file). It’s a user automatically created by the install scripts and I have not yet looked into how to prevent its creation. For that reason I decided to just block it there so that it’s not offered by LXDM. 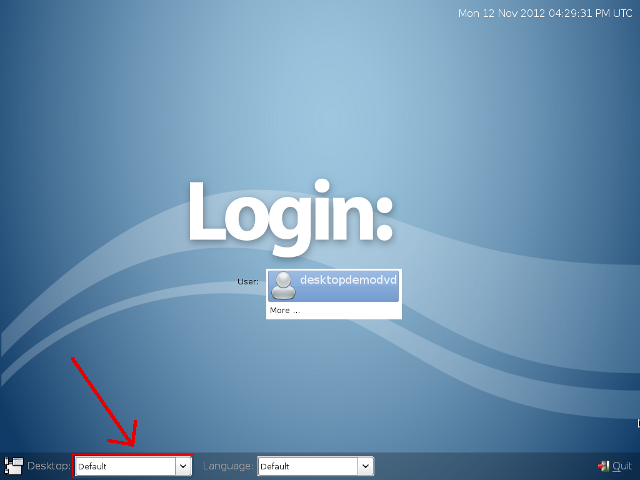 This step is important since we disabled the user “arch” and cannot log in as “root”. The solution suggested for this on the Arch wiki is simply copying over the files passwd, shadow and group (all located in /etc) from a system set up the way we want it. This is actually a fine way and since we’re using virtual machines anyway, it does not hurt to simply clone one, adding the desired user (“desktopdemodvd” in my case) there and copying said files over to root-img/etc on our building VM (using a USB device is probably the most confortable way). That was the easy part. Many DEs will however not work if there’s no proper /home/$username directory present. We could of course create one in root-image/home, but that would be owned by root on our live system so that’s not quite what we want. Again the wiki is outdated (while I’m at it anyway, I should dedicate some love to it when I’m done here, I guess). We want to do things the systemd way! So how to do it in this case? Let’s write a new service for it (woah)! Note: “ExecStart=/bin/chown desktopdemodvd /home/desktopdemodvd” is one line! Yes, if I remember correctly, that was all. You should be able to build the iso now. I don’t know if I did any changes beside these, but this blog entry at least shows two important things: Adding users and using a graphical login manager. There are of course a lot of things you could customize as well and perhaps I’m going to explore some of these in the future, too. But right now I’m going to wait and see what happens with the “DDD”. My next post will deal with what should be considered essential graphical applications – and afterwards we’re getting back into the world of toolkits. DDD #2: The “Desktop Demo DVD”! In the last entry I discussed the situation of Linux desktop environments in general and how it encourages taking various less-known DEs into account for your system, too. Now it’s time to talk about the first alpha version of the actual DDD! If you just want to download it, have a look here. The version I release today is just a little preview. But before I describe what 0.1 includes right now, I’d like to share my vision of what DDD 1.0 should be. A perfect Desktop Demo DVD should come with all available desktop environments the Linux world has to offer. If possible it should also showcase some default applications of the particular DE which are not in the menus of the other ones so things don’t get confusing. Localization at least for the most common languages. Only list the real DEs in the display manager (and not probably confusing variants with different WMs). A short html tutorial which helps the users to discover the most important features of the various DEs could be very beneficial. Some nice artwork would be great, too. This project is to provide an ISO file that can be downloaded and used in either a virtual machine or burned to a disk and then used with real hardware. It is meant to showcase the various DEs that work with Linux and thus give anybody interested the oportunity to quickly take a look at them without all the hassle (i.e. finding out that they even exist, often building them yourself, getting them to run on your distro, etc.). You can download version 0.1 of it from Bitshare. As you would guess when you read the version number, this release is mearly a first attempt. Right now it fits on a CD but that’s going to change. I’ll try to improve DDD if I find time for it and then release a second version. 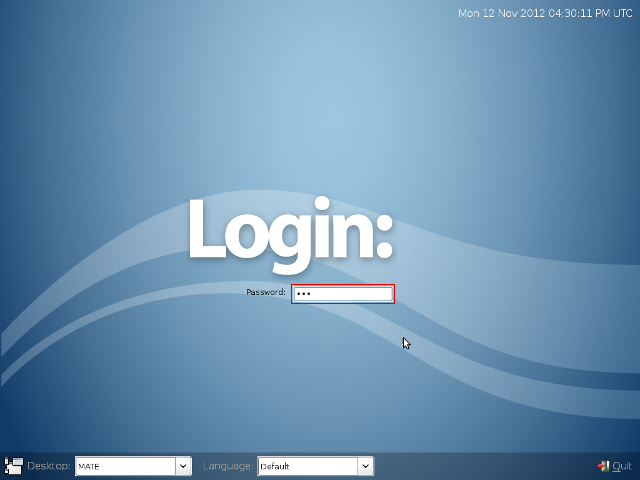 If all goes well you should be greeted by the graphical login manager LXDM after startup. First open the list of available desktop environments (if you don’t change anything, LXDE will be started as default). To do so, click on the list to open it. Now select which one to start and then click on the user “desktopdemodvd”. The password for the primary user desktopdemodvd is simply ddd. Enter it and then press the return key. That’s it! The DE you selected from the list should be starting. There are a few issues I didn’t find a solution for yet, but I didn’t want to postpone things again for an even longer delay. Probably the worst thing is performance: Even when using the ISO in a virtual machine on a fast PC it takes quite a while until the DEs finish loading. Please be patient. Because of that I can’t recommend burning it and using a disk. Also for some reason loging out of E-17 does not work. Please report other problems, make suggestions and give feedback of any kind. I’d very much appreciate it! I can’t promise when (or if!) a new DDD version will be released. The next post will be about the technical side of it and describe how to build an extended Arch live-cd including users other than root and with a graphical login (display manager). It took me a bit longer to write this post (and when I finally did, I forgot to post it to the public). Sorry for that. But now it’s here – and like I promised, it’s introducing a new EERIE subproject! No, I don’t want to predict when the “final breakthrough” will happen nor do I care much for current market shares. And no, I’m also not going to repeat what Linus said about this topic – we all know it and if somebody really doesn’t, it’s easy to find out. To be precise: I don’t mean the situation of the Linux Desktop at all but rather that of the Linux desktop. So – what’s noteworthy here? Well, I can’t put it better than a headline I read in a German magazine quite a while ago: “the desktop is fragmenting / splintering”! Over the years many people have complained that Linux is not “successful” because there’s no standard desktop. There may or may not be something to this claim. The important thing is that it was raised in a time when there were essentially two big DEs which had such a high user base that other desktop environments were only playing underparts. Those two were KDE and GNOME. First KDE Plasma was released and left a lot of people perplexed. Some didn’t like the new style. Others found the system requirements to be ridiculously high (at that time). People who had used KDE for years were not happy with the direction Plasma was taking and were looking for alternatives. Some changed their default DE, some wanted to go on with KDE 3. Efforts of the later resulted in a new project: Trinity DE! The other big desktop environment followed the same path; the idea was to modernize things. Some people liked the new GNOME 3, many others hated it (that word is not an exaggeration). The results? Same thing: Some former GNOME users were unhappy and switched their default DE and a few others decided to go on with GNOME 2’s codebase – and thus MATE was born. Of course this way DEs that were previously more or less underdogs were getting more and more popular. This is especially the case with Xfce which has been around for quite some time but has attracted many former GNOME 2 users since the release of GNOME 3. Another winner is surely the rather young LXDE: Anybody interested in Linux has at least heard of this light-weight DE today. Other than that there are more noteworthy players now. First, there’s Unity. It’s one more modern DE that benefits greatly from nowadays being the standard desktop of the extremely popular distro Ubuntu. Another one is Enlightenment which already has a formidable user-base. Apart from the DEs previously mentioned, new readers of my blog may be surprised just how many other desktop environments there are out there (I’ve blogged about them). Are those inferior to the more popular ones? Hell no! The biggest problem with them is just that they are not well-known! However there are other problems as well. Many distros (especially the smaller ones) do not offer packages for these. Getting them to run on your distribution can be rather tricky and take some time and effort. In case of novice users it can also prove to be a barrier hard to cross. Luckily many DEs offer Live-CDs so that you can easily take a look at them. But having to download multiple ISOs for that reason is also an unnecessary inconvenience. What about a single DVD image that comes with all Linux desktop environments? This way each of them can be tested easily! It also has the advantages that you won’t miss some less-known DE and that you can compare them directly. For those reasons I’d like to introduce project “DDD” which stands for “Desktop Demo DVD“! I’ve already prepared the ISO for the DDD version 0.1. Expect it to be available during the next days!